Lemnos (also Limnos) is located in the heart of the Northern Aegean. It is about 100 kilometres off the Greek mainland. The island has an area of 500 square kilometres and about 18.000 inhabitants. The highest mountain is Mount Vigla with 437 metres. The main settlement is Myrina. The port is located there as well. Lemnos has fairly little tourism. It is as authentic as it gets. Most people there make their living fishing. The volcanic soil is fertile so agriculture is an important business as well. The Greek army has bases there and a significant number of soldiers are stationed on the island. That doesn't exactly help tourism. Most hotels you will find in Myrina and the second biggest town Moudros (Lychna). Some of them are even a little upmarket. You'd find some private rooms in other villages as well. About 5000 people live in Myrina. The local beach is quite good; a long and sandy strand. In the local capitol on top you'd find a cute little museum and a number of very good restaurants (tavernas) with fresh and delicious fish. Prices are moderate. 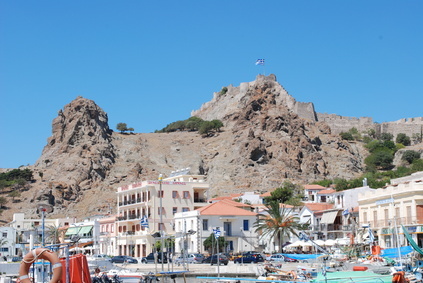 The main tourist attractions on Lemnos are the ancient theatre at Palaiopolis, the picturesque village Contias and the Venetian port in Myrina. Another attraction are the many birds you find here. Just to give you an example; there are hundreds of flamingos living on Lemnos. Most visitors that come here look for a quiet and authentic place that kept the old traditions. Hiking is quiet good, if you look for any kind of nightlife don't bother going to Lemnos. Getting to Lemnos: Daily ferries to Lemnos go from Piraeus (Athens port) or Rafina (not far away from Athens). During summer there also is a frequent boat to and from Kavala and Thessaloniki on the mainland. All major settlements on Lemnos can be reached by bus. The island even has a modern and surprisingly big airport. The only problem with it is that there are hardly any flights. There is little else than the regular connection to Athens and Thessaloniki. If Lemnos is still too busy for your liking try Agios Efstratios 30 kilometres south of Lemnos. Only about 300 people live there. Agriculture is the main source of income on Agios Efstratios. There are hardly any roads or cars for that matter. To get there take the boat from Lemnos. Less frequent but existing is a ferry connection to Athens, Lesbos and Chios.